The Vegas Shopping Centre opened its doors on the first day of summer in 2010. It is located at the intersection of the MKAD and highway (click on map above). It is possible to get to Vegas either by car - parking is very convenient and can take up to 7,000 cars - or by metro to 'Domodedovo' station and bus number 37and 471 will get you right to the shopping centre. Vegas is a rather unusual shopping complex. It remains the first and only establishment of its kind in Russia for many reasons. 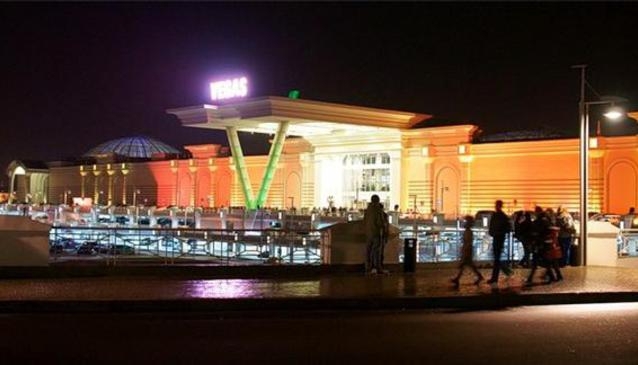 Firstly, the 'Vegas' has the largest total area of 400,000 square meters with the largest retail space of 130,000 square meters. Secondly, it is still the only Russian shopping mall that combines an indoor two-level park of extreme entertainment - this alone occupies another 5,000 square meters! Other attractions at the Vegas shopping mall include an 18 metre Ferris wheel, a 19 metre 'Tower of the Fall', a small ice skating rink and a cinema complex including the multiplex 'Luxor' with 9 rooms and both 3D and 5D facilities. In short, Vegas is not just about the shopping but also about the whole family's leisure and entertainment. There are, of course, a wide variety of cafes and restaurants available - from the casual and budget diner to the more luxury and fine cuisine restaurants. This same rule also applies to the retail shops. The actual shopping centre is divided into 'streets' - all beautifully decorated. There are the Jewellers Street and the Fashion Avenue, then Ginza the night street which beams with neon lighting and the Bazaar area transports you to the heart of the East. Getting around, establishing where you are and finding what you are looking for can be a pretty daunting task in such a large shopping centre... but not at Vegas... electronic assistants are available at virtually every corner and they make navigating this super complex very easy.